﻿ Luxand - Blink! - Log in to Your PC by Simply Looking at It! Luxand Blink! - Log in to Your PC by Simply Looking at It! Logging into Windows has never been easier! Simply look into your webcam and you’ll be logged into your account in the blink of an eye. Blink! 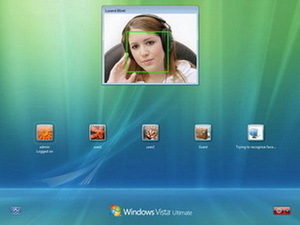 employs advanced face recognition technologies to provide automatic, quick and reliable login for one, or multiple, computer users. Supported OS: Windows Vista and Windows 7. Windows 8 and Windows 10 are not supported. With Blink!, you can login day or night. Sophisticated face recognition algorithms automatically adjust for varying lighting conditions, making login possible whether window or artificial lighting is used. New Haircut? Swapping Glasses for Contacts? No Problem! Advanced biometric identification algorithms used in Blink! enable it to adjust to changes in your personal appearance. Grow a beard or mustache, or shave it off. Use makeup or dye your hair. Wear or remove glasses or contact lenses - Blink! will recognize your and let you login to your PC, no matter what. Say goodbye to those long, complex passwords demanded by your corporate security policy. With Blink!, you can sign into your account by simply looking at a webcam. There are no false positives and no delays in authorizing access. Blink! provides additional security benefits by making it easier for you to automatically unlock your PCs by simply looking into a webcam. Stolen passwords are becoming less of an issue as Blink! photographs and timestamps you every time you login, whether you use a password or a biometric sign-in. Journaling account logins helps identify hijacked accounts and can determine who logged in using stolen credentials. Blink! is backed up by an unconditional 90-day money-back guarantee. Try Blink! today and you’ll never want to type a password again! Protected by U.S. Patents 8,842,889; 8,879,804.